Wash and soak rajma overnight. Cut each shalgum into 4 pieces. 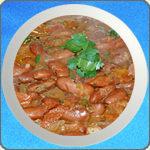 Pressure cook on high flame rajma, shalgum, salt, water, saunf, saunth, elaichi and 2 tablespoons oil. Heat remaining 1 tablespoon oil and sauté elaichi, jeera, laung and hing on low flame stirring continuously for ½ minute. Open cooker. Add sautéd items along with a little more water if required, and boil for another 6-7 minutes.